This was the problem with a walk down memory lane. It was almost always foggy, and one was likely to trip and fall. There’s something about Vietnam’s major cities, Hanoi and Saigon, that attract me. I had a love-hate relationship during my time in both, which is why I chose to depart Vietnam after two months rather than explore for the additional month remaining on my visa. I could identify what drove me to dislike both cities, and to some extent that is my own fault. I didn’t get out of Hanoi’s Old Quarter and I was in Saigon during Tet. Both of those conscious decisions caused me to dislike Vietnam. 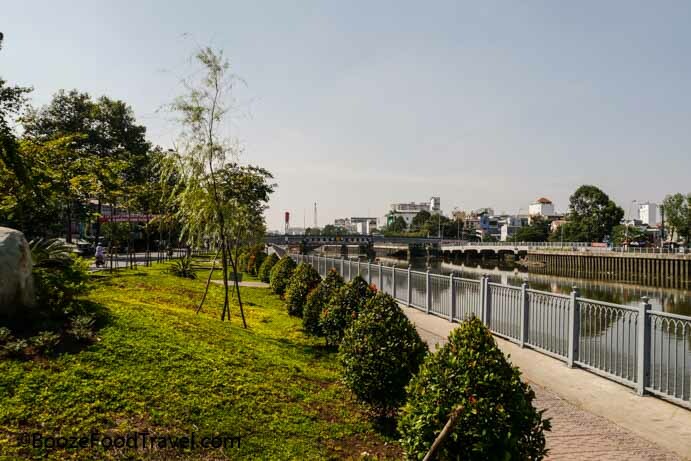 That my stay in Hanoi ended on a sour note tainted the first part of my stay in Saigon. It’s disappointing because I have wonderful memories of my two months in the country. But then there are the little things that made me love the cities, or at least enjoy my stay. This is a reversal of perception–usually it’s the little things that lead me to find fault in a place. There were moments in Vietnam that made me smile uncontrollably and laugh, tastes that made me stop to savor, and sounds that calmed me. While I believe I couldn’t live in either city long term, I have admiration of joyful memories to take me back. In Hanoi, I found a few spots in the Old Quarter or just outside of it that I could return to for a moment of peace. The narrow, crowded streets that could give one a heart attack while attempting to cross made each day an adventure when all I wanted to do was find dinner or grab a beer. And after moving at a snail’s pace through the streets, dodging motorbikes and hawkers, I could find myself at a destination that provided breathing room, where I could tune out the noise and watch the lights of the city appear as the sun set behind the hazy sky. Sometimes it was just a matter of reaching Highlands Coffee — a local coffee chain that had clean banh mi for lunch — to grab a meal and take in the view from three floors above Hoan Kiem Lake. It was the only view of the lake that was undisturbed by hawkers or students who approached requesting photos and English conversation. Other times it was a matter of fighting my way from my room at Hanoi Graceful Hotel where I was working online all day to go grab the 2-for-1 75-cent happy hour special at Central Backpackers Hostel. I was able to meet some travelers there who had tips on places to see in my limited free time. It certainly wasn’t the same atmosphere as the dirty Bia Hoi around the corner from my hotel that served 33-cent draught beer, but that dingy little place was for other evenings. More than anything, it was making a friend in Hanoi. A young woman stood on the side of the road inviting people into a restaurant a block or so from my hotel, and one night I decided to stop in. After talking with her during my time in the restaurant, I decided I’d find her again after my trip to Cambodia. We became friends and have kept in touch since then–she even visited Taiwan during my second stay. She gave me my first ride on the back of a motorbike, a rather terrifying experience as I don’t like being a passenger and Hanoi traffic is not exactly organized. That experience gave me a little more courage when I needed a motorbike taxi ride back to my apartment in Saigon a few times. I found a bit more breathing room in Saigon, or maybe it was sidewalk space. I rented a large private room in a building through Airbnb — it was down a quiet alley off Le Van Tam Park in District 1. The area was surrounded by embassies and consulates, which meant that there was more security and fewer crowds. Is this really Ho Chi Minh City? I encountered plenty of frustration in my first two weeks in Saigon — the local market refused to bargain and tried charging ridiculous prices for produce, so I ended up only buying bananas because the one vendor gave me a fair price that was still likely higher than the local price. There was also a lack of restaurants in the immediate area for lunch, which meant I spent most of my break walking in the oppressive heat to get take-out to eat while I worked. After Tet, I found a little shop in my alley that had cheap lunch for local workers — it wasn’t anything special, but rice, fried fish, and vegetables for about $1 was good enough for me. A quaint cafe also opened at the end of the alley, which I headed to a few times to grab a drink after work and play with a couple kittens that hung around outside. Every now and then I headed out in the early morning to one of three Highlands Coffee shops within a 15-minute walk that had a breakfast buffet. For about $6 I could eat all I wanted and drink as much coffee as possible for about three hours while I worked — the coffee shop had decent Wi-Fi and an outlet for my laptop. By the time breakfast was over, I was over-caffeinated and so full that I wasn’t hungry until dinner. If that location was full, I went to the one down the street that was in an old wood building — it was beautiful architecture, but it had no air conditioning, making it difficult to work. During my first weekend in Saigon, I took a tour of the Presidential Palace. As I entered the grounds, I found two young women taking photos of each other and I offered to take photos for them. They were both recently returned students from the US, so it was easy to talk with them. For the rest of the day we walked around the Presidential Palace and talked; we exchanged Facebook contacts before parting ways. Only one of them lived in Saigon, and she contacted me after Tet to go out to dinner. She introduced me to her friend and some Korean exchange students she had just met. Before I left Vietnam, I met up with the two women for meals a few more times — they introduced me to some good food and interesting streets. Most importantly, they directed me to the Co.opmart, a government-run supermarket with set prices so I could easily buy tons of tropical fruit to enjoy for breakfast. After our second dinner together I regretted already booking my flight out of Vietnam — I was beginning to enjoy my time in Saigon and had found routines that made life easier. After the city returned to life following the Tet holiday, I found places to relax and enjoy myself. I found a roadside restaurant that opened in the evenings — small plastic chairs and tables with cheap food and beer. I discovered a few good noodle shops that were much cleaner than the street vendors and set out to find more high-end restaurants farther from my apartment. I grew more comfortable wandering the streets each day. There was still plenty of daily frustration — hawkers approaching far too often and the ever-present danger of crossing the street. There was even a moment when I couldn’t physically cross a street with idle traffic because there wasn’t enough space between all the motorbikes — I was trapped on a narrow curb until the traffic began to move again. More than anything, I have the friends I made in Vietnam to thank for my time in the country. Without them, I would have written off much of my time there. I have been fortunate enough to meet all three in Taipei and hope to be able to show them around again if they choose to return. Have you ever had a love-hate relationship with a place? What made you love and hate it? There is some beauty in the contradiction some places have. But I guess it is because there is also beauty in imperfection. I have lived far from my hometown for several years now, and the differences in culture are inevitable. In comparison, there are things that I admire and others that I strongly criticise.